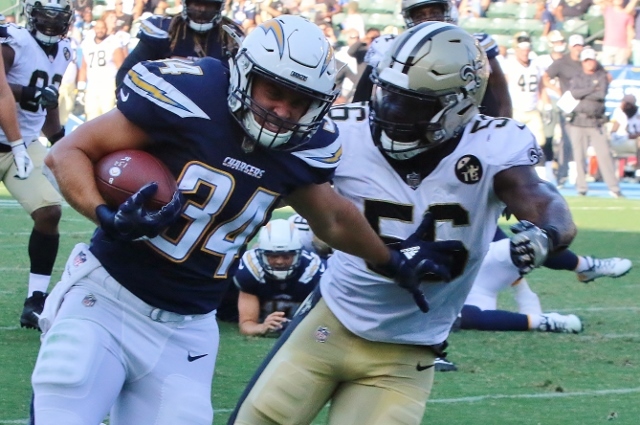 (Carson) – The Chargers scored first but it was also their last as the Saints scored 36 consecutive points to beat LA 36-7 Saturday night before 22,597 at Stub Hub Center.It looked good for the Chargers early when Derwin James intercepted Drew Brees on the first possession and LA took over at the New Orleans 37. They drove all the way down to the Saint four-yard line but were stopped on fourth down. 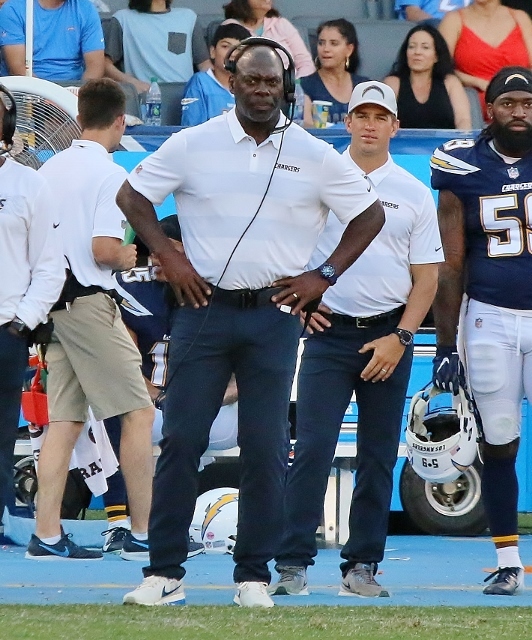 But on the next drive the Chargers converted going 42 yards in 8 plays capped by a five-yard touchdown run by Detrez Newsome for a 7-0 lead with 3:13 left in the first quarter. That was the only time the Chargers scored in this third exhibition game. The Saints responded with an 11 play, 75-yard march. Alvin Kamara plunged in from two yards out for six and Brees hit Michael Thomas on a quick out for the two point conversion to give New Orleans an 8-7 lead early in the second quarter. Wil Lutz booted a pair of field goals later in the second to extend the Saints lead. He kicked a 25-yarder when the New Orleans drive stalled at the Charger eight-yard line. As the second quarter clock ran out he split the uprights again from 35 yards out for the seven point halftime lead. Both of those drives were led by Tom Savage who replaced Brees in the second quarter. Cardale Jones took over for Philip Rivers in the second as well for LA. Rivers completed 5 of 7 passes for 29 yard while he was in there. Brees was 7 of 9 for 59 yards and a pick. In the third quarter third string quarterback Taysom Hill led New Orleans on an eight-play, 48-yard drive that he capped with an 11-yard touchdown romp. Hill then scooted into the endzone for the two point conversion and a 22-7 New Orleans advantage with 2:29 left in the third. Marcus Williams stepped in front of a Geno Smith pass and all he could see in front of him was green as he scampered 58 yards for a pick six early in the fourth quarter. Boston Scott ran in the two point conversion to up the New Orleans lead to 30-7. After the Chargers were forced to punt again Hill engineered a 13-play, 60 yard drive. Tre’Quan Smith corralled a five-yard TD strike from Hill over the middle to finish it. The 36 consecutive points gave the Saints a 36-7 lead and eventually the final. Savage led the Saints in passing finishing 7 0f 10 for 99 yards. 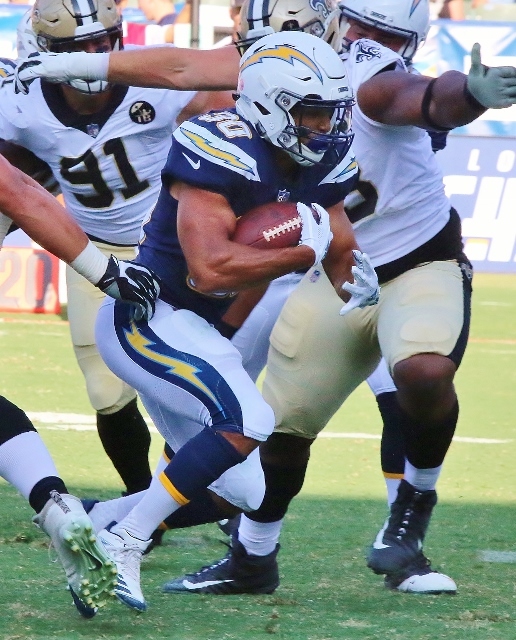 Austin Ekeler was effective for the Chargers rushing for 50 yards on six carries. The Chargers are now 1-2 in the preseason while New Orleans improved to 2-1. The Chargers have one exhibition left – against the 49ers next Thursday night at Levi Stadium. LA kicks off the regular season September 9 at home against the Kansas City Chiefs.